A new Taub Center research study, conducted by Prof. Ayal Kimhi and Arik Horovitz, is the first of its kind to quantify the effect of high school math on labor force achievements – employment rates and wage levels. The study answers questions like: Does the level of math studied in high school have an effect later in life? Is it worth making the effort to study higher-level math or is a lower level sufficient? What is the role of natural learning skills in the entire picture? To this end, a unique data base was constructed that followed a group from bagrut [matriculation] exams, through higher education and to the beginnings of their career paths (age 29). The research was funded in partnership with the Trump Foundation. The Taub Center study found that gender affected the level of math studied; 44% of women took 3-4 units of math as opposed to 33% of men. In contrast, 10% of men took their bagrut exams at the 5 unit level, as opposed to 7% of women. When comparing genders, significant differences were found. First, among those who took 4 units of math, the share of women with an academic degree is significantly greater than the share of men with an academic degree. Nonetheless, in those areas of study that lead to professions with higher wage levels – like economics and business administration, the exact sciences and computer sciences – the majority of matriculating students are men. It was also found that increasing the level of study for those who did 4 units of math (using a hypothetical formulation) to 5 units significantly increases the likelihood of their completing an academic degree, especially among women, and also had an effect on their choice of a field of study. The most notable differences are a reduction in the tendency to study social sciences and an increased tendency to study medicine, economics, business administration, exact sciences, and computer sciences. In particular, the frequency of studying computer sciences increased by half among men and more than three times among women. The frequency of studying economics and business administration went up only slightly for men but increased significantly among women. As a rule, moving from 4 to 5 units of math enables entrance into fields of study that result in higher wage levels later. The impact is greater for women then for men, and so this move narrows the gender gaps in the distribution of academic fields of study. The effect of academic field of study on wages differs substantially for men and women. Men with an academic degree in Jewish studies, social sciences and law earn (per hour) less than those without an academic degree, while men with a degree in education, medicine and life sciences, economics and business do not earn more than those without a degree. Among women, though, a degree in Jewish studies, humanities, education, medicine and life sciences, social sciences, and primarily economics and business means higher salaries relative to those without a degree. A degree in engineering and the exact sciences or in computer sciences contributes significantly to the wage level for both men and women, although its contribution is greater for women. 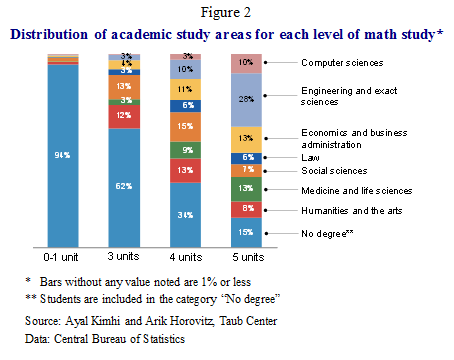 Kimhi and Horovitz found that there is also importance to nationality, and apparently the opportunity to study math at a higher level is not equally accessible to all – the number of Jews studying math at a higher level is substantially higher than the number of Arab Israelis or any other minority group. Among Christians and Druze there is a greater tendency to study math at a higher level than among Muslims or other minority groups. The Taub Center study found that for those completing 5 units of math, monthly income and hourly wage were double the monthly income and hourly wages of those who did not take math at all. Income increased with the level of math studied even when comparing students who received the same score on the bagrut exams, and this fact is especially pronounced in the move from 4 units to 5 units of study. Beyond this, the higher the matriculation score in math, the higher the income level, and this was especially true in the move from a score of 81-90 to a score in the 91-100 range. For example, when the income levels of those who took 5 units of study were examined, the largest gap found was between those who scored between 81-90, and earned NIS 56 per hour, and those who earned NIS 78 per hour and scored between 91-100. That is, income is closely correlated with the level of math studies and the bagrut score. It was also found that academic degrees that are considered prestigious are worth more in the labor market. Computer science degree holders earn 77% more than those without an academic degree, 90% more than those with a degree in Jewish studies or the humanities, and 40% more than the next group in the degree ranking – graduates of engineering and the exact sciences. On the other hand, there is no significant income gap between graduates of universities and graduates of colleges. Moreover, in certain fields, those without an academic degree earn more than those with a degree – primarily among those with a higher level of math. For example, for those who have studied 3 or more units of math, the wages of someone without a degree are higher than those of someone with a degree in the social sciences. 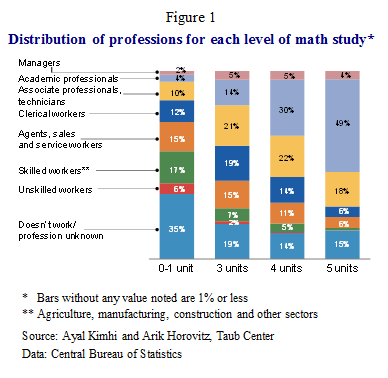 In addition, Kimhi and Horovitz found that the higher the number of units of math studied, the more likely the individual is to be employed in a more prestigious profession (Figure 1). The rate of academic professionals rose from 4% among those who took the exam at less than a 3 unit level to 49% among those who studied at the 5 unit level. An interesting finding is that the rate of managers does not change significantly in the move from 3 to 5 units of study. The study also found a relationship between the number of units of math studied and the area of academic study (Figure 2). Among those who studied 5 units of math there is a higher rate of graduates in computer science, engineering and the exact sciences, while among those who studied 3 and 4 units there is a higher rate of degree holders in the social sciences, arts and humanities. Holding a degree in computer sciences raises one’s income considerably, but degrees in engineering and the exact sciences, as well as degrees in economics and business, also have a positive contribution – they are all more common among those who have studied math at a higher level. The Taub Center’s research study found that studying 5 units of math is also directly positively correlated with income (that is, statistically controlling for various variables), especially among women. In order to examine the effect of different variables, the researchers controlled for a variety of socioeconomic characteristics: gender, religion, family status, children, homeownership, father and mother’s country of origin, immigrant status, and area of residence. In addition, they took into consideration other bagrut scores that could indicate learning skills and intelligence. Even after all of these variables were taken into consideration, a theoretical scenario analysis showed that moving a student from 4 to 5 units of math study (without a change in his bagrut score) could increase wages by 10% – of this 6% is the direct effect and 4% is due to increased income from the fields of study characteristic of someone learning 5 units of math (primarily computer sciences). The direct effect means that even when the other variables are statistically removed, including the field of academic study, the economic employment sector and profession, differences in income remain to some degree between those examined. Even in this situation the results differed between men and women; while the direct effect is 6% for both men and women, the indirect effect through field of study is 3% for men and 5% for women, which reflects the greater impact of higher level math study on women’s choice of academic field of study. All in all, the effect of moving from 4 to 5 units of math increases the wages of men by 9% and those of women by 11%. The main conclusion that arises from the study is that the level of math study is of great importance for labor market achievements, including employment rates and income level, and academic field plays a considerable role in this. Studying math at a higher level enables acceptance to more prestigious academic departments like engineering, sciences and computing, and this in turn, has an impact on finding quality employment at higher wage levels. 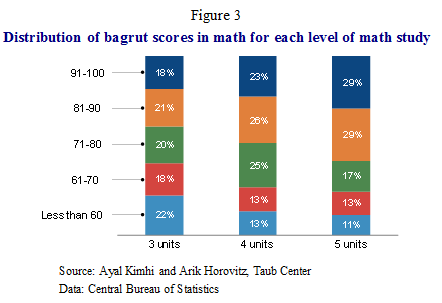 Despite the knowledge that math study influences academic studies, there is a continuous decline in the rate of those taking the bagrut exams at the higher math levels – from 20% to some 13% of all examinees between 2006 and 2011. In a recent Taub Center study, Senior Researcher Nachum Blass wrote that a possible reason is the strengthening of the approach that judges a school by its bagrut certification rate, which in turn greatly influences the administrative policy of schools and teachers, and the strengthening of the functional approach to the bagrut certification, that places greater emphasis on the overall average score. Teachers and students make a calculation of what is preferable: a relatively high score on a lower level test or a lower score on a higher level test (say, more units of math), and in this way, both students and schools have come to the conclusion that testing at a lower level is preferable. In contrast to what is commonly believed, though, the researchers found that there is a positive correlation between the test score and the number of units of study; that is, the test score is higher, on average, as the number of units of study is higher (Figure 3). Thus, the fear of a lower score when testing at a higher level of study is not necessarily justified. Moreover, when testing the scenario in which the math study level was increased from 4 to 5 units while the bagrut score was simultaneously reduced by 10 points, it was seen that the reduction in the score decreased the effect of raising the level of study, but did not negate it completely: the average increase in wages in this case was 7% versus 10% if the score remained the same.